This healthy egg roll bowl is vegan and gluten-free. Make this easy weeknight dinner in 10 minutes. It’s packed with the satisfying flavors of an egg roll – in a bowl! 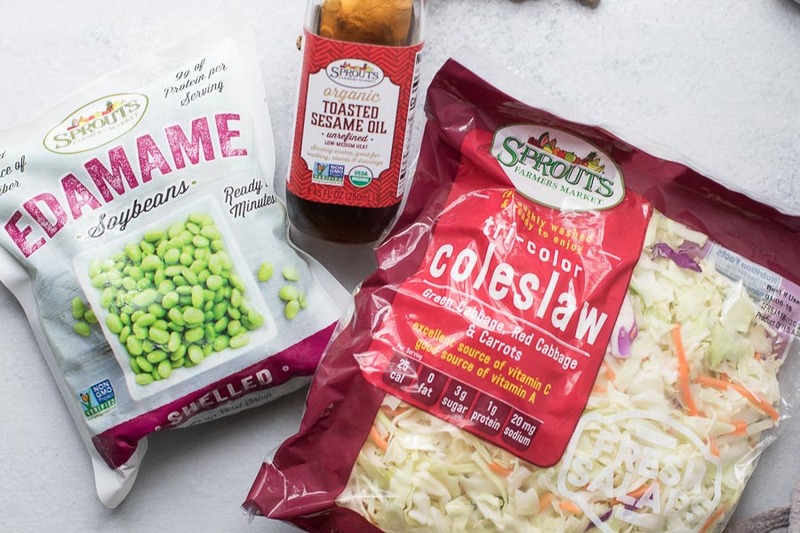 This recipe is sponsored by Sprouts. 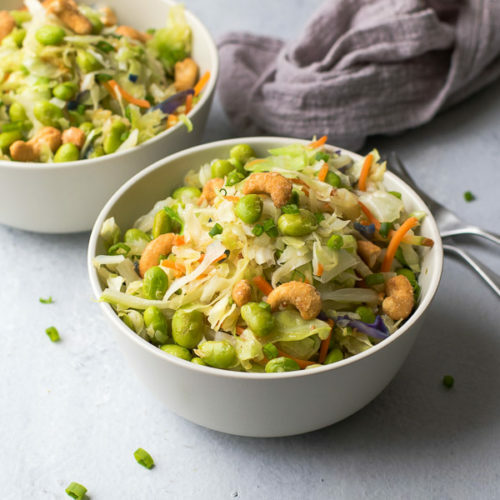 This healthy egg roll bowl is naturally vegan and gluten-free. 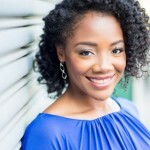 But the fact that it takes just 10 minutes and minimal prep is the reason I love it! There is a time and place for chopping vegetables and removing edamame from the pod but this is not it. With just a few quality ingredients, you can get dinner on the table in minutes. It’s packed with vegetables and plant-based protein for a satisfying dish. Use toasted sesame oil. You can use all toasted sesame oil for the saute but I found it to be a bit overpowering. Feel free to swap the regular sesame oil for any neutral tasting oil you have on hand. Store your toasted sesame oil in the fridge to keep it fresh! Don’t crowd the pan. Instead, cook each ingredient as listed. Use the biggest skillet you have or cook the vegetables in batches for a good sear. That’s where you get the flavor. Without this, the cabbage will steam. While that’s OK (I’ll still eat it), the recipe will lack the crunch and depth of flavor that really makes this egg roll in a bowl so craveable. Add a drizzle of chili sauce. This will pump up the flavor and help you get that real egg roll flavor. This easy recipe is best served warm but you can eat it at room temperature. Tag me on Instagram know when you make this one! 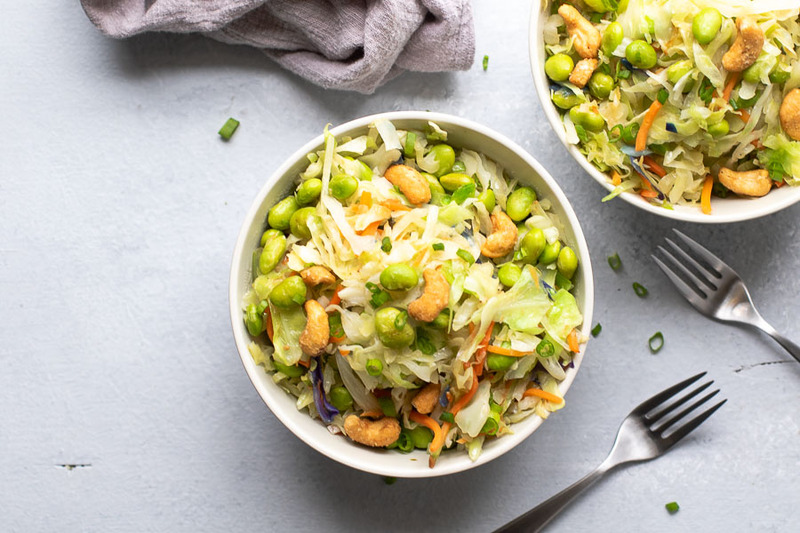 This healthy egg roll bowl is vegan and gluten-free. Make this easy weeknight dinner in 10 minutes. 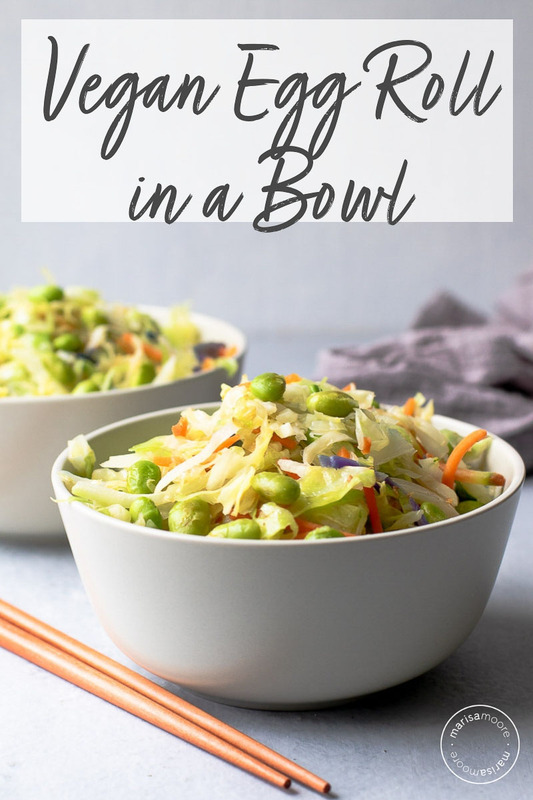 It's packed with the satisfying flavors of an egg roll – in a bowl! Heat sesame oil in a large skillet over medium-high heat. Sauté the garlic, ginger, and (optional) red pepper flakes just until fragrant. Add the edamame. Cook until it thaws and starts to sear. Add coleslaw and carrots. Sauté until the cabbage is cooked through, about 4-5 minutes. Season with salt and top with cashews and green onions before serving. This egg roll bowl looks so good. Perfect for a light lunch or dinner. This sounds Marvelous! I can't wait to try it. Great salad to have for a healthier lunch. I need to try it, thanks for sharing! 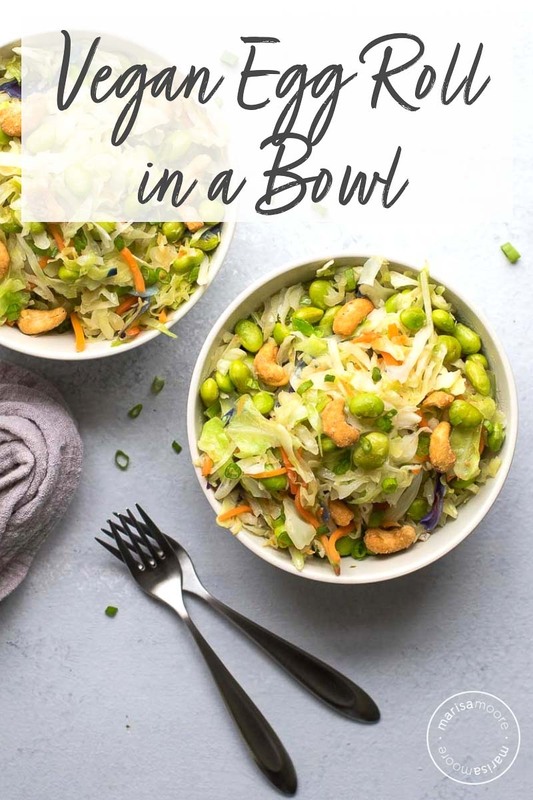 This egg roll in a bowl recipe is such a great idea and is sure to keep me on track with my healthier eating this new year. Yummy recipe. Love this lower carb alternative. Ah thanks for the reminder to cook everything in order. It's tempting to shortcut sometimes but not at the expense of that crunch and flavour!